Like A Rubber Band, We Are Only Useful When We Are Stretched. GOD made the human body in such a way that we can take a lot of physical training and stretching without breaking down and in fact grow stronger from there each time. One may not realize it, but we have a lot to learn from the rubber band. Most people only ever use a tiny portion of their potential. They live their lives getting by and for the most part settling for mediocrity. Unwilling to stretch and leave their comfort zone, they never find out what they are truly capable of or reach their ultimate dreams. Reaching your potential is a ‘unique’ experience. It needs to be something you understand. It cannot be compared to the person sitting next to you. Don’t get caught up in the ‘rat race’ thinking life is about beating the person next to you in the race—your ruler to measure up is your own potential and not someone else’s. Take a few seconds and think of all the possible ways you can use a rubber band. The possible uses of a rubber band may be in the hundreds or even the thousands. Now try thinking of all the possible ways to use a rubber band without stretching it. My guess is the answer you came up with there is zero. A rubber band is completely useless without its ability to stretch. It doesn’t only apply to physically stretching although stretching and exercising can hurt. What it means to stretch means to reach farther than you ever have before, and extend your abilities beyond your comfort zone. We can’t improve our current way of life if we aren’t willing to stretch a bit farther and a bit faster than before. 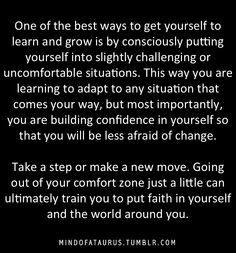 Our comfort zone has to grow, it has to develop and improve. This is vital to life improvement. Put it between the biggest finger on each of your hands. Pull your fingers apart, stretching the rubber band. Now, imagine that your right hand is your ideal, pulling away from your left hand, which is your current situation. That tension between your fingers is the same type of tension that exists when you dare to dream and envision your ideal life. The moment we do that, we create what David Emerald calls “Dynamic Tension” in his great book, The Power of TED. Here’s the challenge: What do we want to do when we feel that tension between our fingers and between our ideal and where we are? Relieve it, right? As Victims, we compromise our ideal vision and then complain that someone’s persecuting us. As Creators, we know that “It’s impossible to invest your soul in a compromise.” So we hold that tension and take what Emerald calls “Baby Steps” toward our goal. As you stretch yourself, the strength at first is in the resistance of the band. If you aren’t really committed to your goal, the band will bounce back at any sign of discomfort. Sometimes it feels like the world is against you and everything can be going wrong, but that is just a false perception. Your ego is making up stories to get you to retreat. Most of the time, the ego wins. That is why people find it hard to change. People don’t like change. But in order to grow, we must be willing to embrace positive changes in every aspect of our lives. Here is what is really happening. You are moving out of your comfort zone and the fears that kept you there for so long are going to rear their heads to tempt you to go back to safety. You are stretching like a rubber band and feeling the resistance of your ego-self. Your ego is in charge of your survival. If you weren’t afraid of new things, you would probably not be alive today. Although handy in keeping you safe from mortal danger, the ego doesn’t know the difference between a life-threatening situation and an imagined fear. The rubber band conditions you to expand your consciousness and is actually an ally in moving you forward. Disguised as the enemy, this stretching and pulling builds your character, your confidence and courage so you can be ready to receive what you want. If you want to move beyond your conditioned life patterns, you must face the discomfort of the resistance and WELCOME IT. Anyone who tells you there is an easier way is selling you snake oil. You must move through the resistance to build your mindset muscle to handle the new life you want. The pressure and stress that the rubber band encounters is, in most cases, not enough to break it. We get upset and angry; it’s a part of life. But the important thing is the overall trend. We must be able to remain persistent even when things don’t go exactly the way we had planned. Accept that tension and stress will come your way, keep it together, and move ahead. We may create the greatest plan on Earth, but chances are our plan will encounter trouble, change and setbacks. If we can’t deal with these things, the plan that we spent so much time creating is useless. Things will not go 100% according to our plan. It simply isn’t possible. When a problem flies in from nowhere, don’t get frustrated and give up. Simply accept the change and adjust. If you are tired of settling for average and mediocrity it’s time to stretch yourself. Do things that scare you. Leave your comfort zone. Embrace new opportunities. Stretch the rubber band. We must be flexible and see change as a natural and helpful element of life. The greatest people in the world, the ones who have made the biggest difference and touched the most lives, have lived their entire lives stretching themselves to the very end. Like rubber bands, we must constantly be stretching ourselves in order to reach our potential. This entry was posted in Health and Fitness, Self-Improvement, wellness, World and tagged 2015, anthony robbins, emotions, Fear, goals, growth, Happy New Year, health, human potential, mind shift, motivation, Rubber Band, Self Discovery, success, T.D.Jakes, The Rock, True Self, Unbroken, wake Up Call. Bookmark the permalink.